With a focus on simplicity and the beauty within colour, material and form;Katie aims to create a range of artworks combining subtle gradients, miniature slipcast ceramic vessels and other complimenting materials. The process of colouring slip and creating subtle gradients is what she finds most exciting; enjoying the technical process behind creating each colour and how different experiments can give interesting and new results. 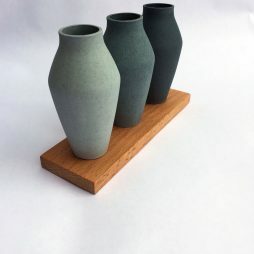 Using playful composition between the vessels and wooden frames emphasises movement alongside the gradient to replicate her inspiration, the sea and sky.